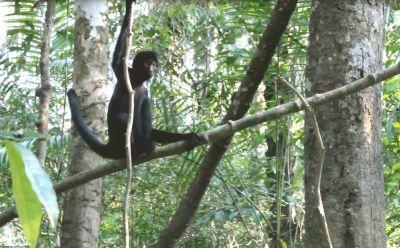 The Projects Abroad Conservation team in Peru have successfully tracked and monitored a group of spider monkeys that the organization released back into the wild. “It’s great to see that these animals have re-integrated into their natural habitat” says Stuart Timson, Conservation Director at Projects Abroad. The eight monkeys were the fourth group of these primates to be released in the Taricaya Ecological Reserve, situated in the Peruvian Amazon, since the project began in 2010. The conservation team have been working hard to reintroduce the locally extinct species into the wild. With increasing habitat loss, a long gestation and rearing period, and a worrying number being captured for pets, their numbers have been rapidly depleting. Projects Abroad’s reintroduction and rehabilitation project is the only spider monkey release program in the country that is recognized by the Peruvian government. The Amazon Rainforest Conservation Project in Peru seeks to reverse the damage done in the Amazon through maintaining ecological processes, preserving biodiversity, and promoting the sustainable use of resources. Find out more about the Amazon Rainforest Conservation Project in Peru here.